Christopher David Fernandez has excelled in the hair industry for over eight years. He attended Paul Mitchell Cosmetology School in Costa Mesa and graduated with honors in color and cut. 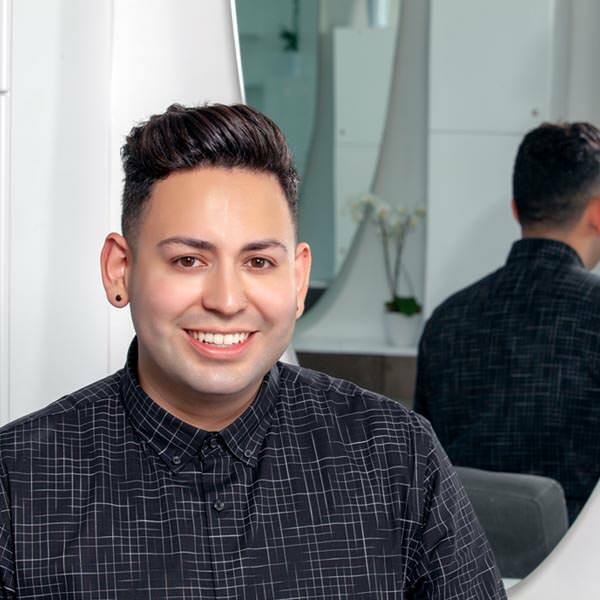 Christopher David joined Ramos Carreon Salon in 2014; he had the privilege of assisting Loren Ebarb and Sylvie Vaught some of the Salon’s very best before securing the assistant position to co-owner Robert Ramos. Under the direction of Robert, he gained the experience of working with celebrity cliental and had the opportunity to work on magazine photo shoots, music videos, and NBC’s The Voice. Throughout his experience in the entertainment industry, he was able to secure his own celebrity cliental such as Aimee Garcia (Fox’s Drama, Lucifer and ABC’s sitcom, George Lopez) along with Brynn Cartelli (winner of NBC’s season 14, The Voice). Christopher David prides himself on being a versatile stylist in southern California, he has maintained exceptional cliental not only in Los Angeles but Orange County as well. His drive to do good hair comes from his passion to continuously educate himself, whether it be taking specialty classes for various techniques in women’s and men’s cuts or balayage and highlighting expertise, he believes there is always something new to learn in the ever-changing world of being a great colorist/stylist. Christopher David always provides his honest opinion, he prioritizes educating his clients not only on what will look good but also informs them of maintenance required to protect the integrity of the hair.